An update rolling out to Chrome on Android devices comes with a neat little search trick that lets you search for that word within the same Chrome tab. It’s called Touch to Search, and it’s bound to make the often frustrating task of mobile browsing a hair more convenient. So for example, I highlighted the word “America” and a little panel popped up at the bottom of my phone screen. 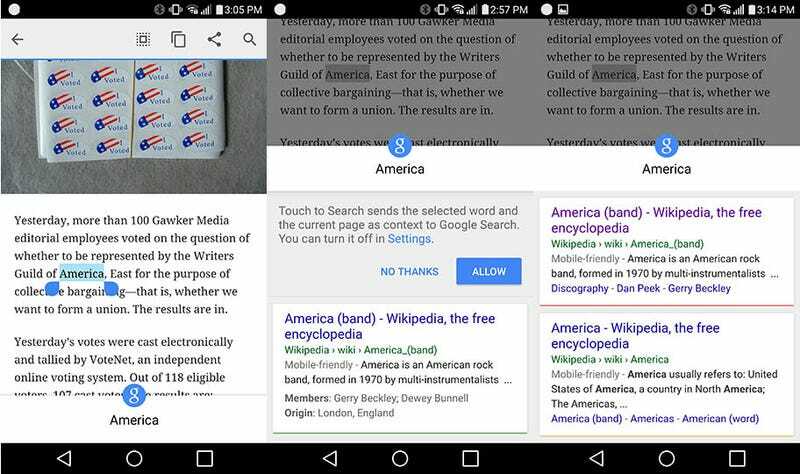 Tapping that panel pulls up the first page search results based on that word and the URL of the page you’re on: America (Band), America (Country), etc. Android Central found the feature on a Moto X. I’m using an LG G4. This trick could help save you from the endless proliferation of browser tabs that accumulate when you’re browsing on your phone. Rather than opening up a new window to look up the weird word you just read, you can just Google it quickly. There’s a good chance that whatever piece of information you’re looking for is on that first page of search results so you don’t ever need to open up anopther tab. At the very least, it’s faster and simpler than hitting the tabs button and typing in a term every time you want to search for something.